A raft of Prickly Saltwort just above the high tide mark. Any that were below were probably washed out of the sand with the High Tide and Green Grass a day earlier, which probably washed away most traces of Isle of Man Cabbage at the same time. Living a life of danger on the drift-line of sandy shores. A feather for scale. 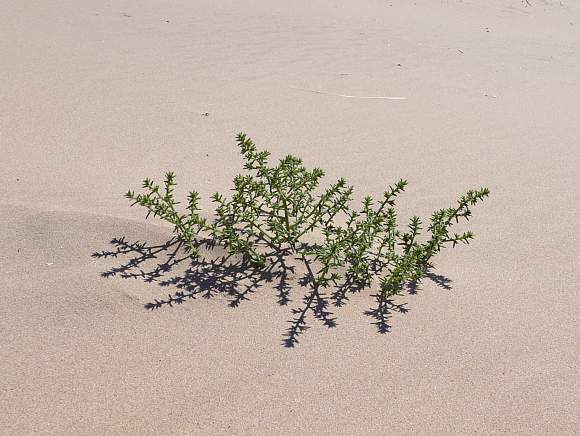 If they are not washed away by storms they can get buried alive under wind-blown sand in hot dry conditions, as here. Bird's-eye view. 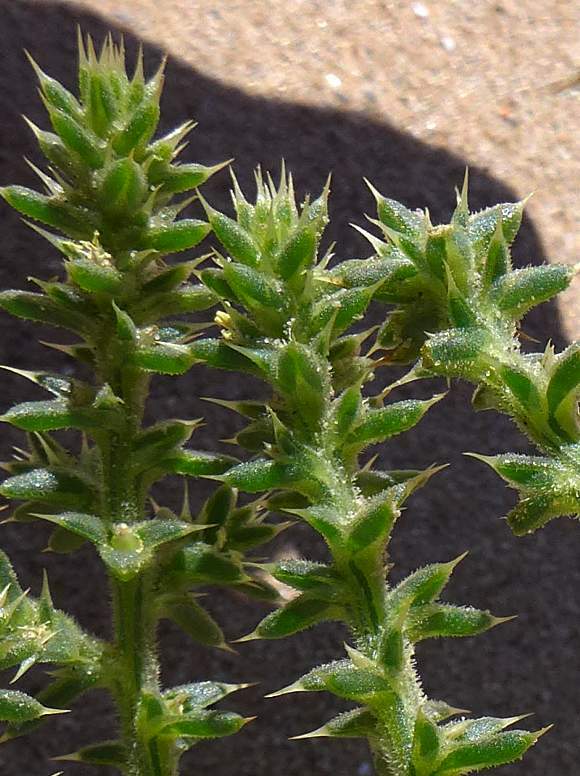 It is spiny, highly-branched, dark-green and somewhat sprawling. A dying plant. Stems are ribbed and highly branched (alternate branching). Multiply-branched (the branches are alternate) with somewhat sinuous stems. The fruits are surrounded by three withering bracts. 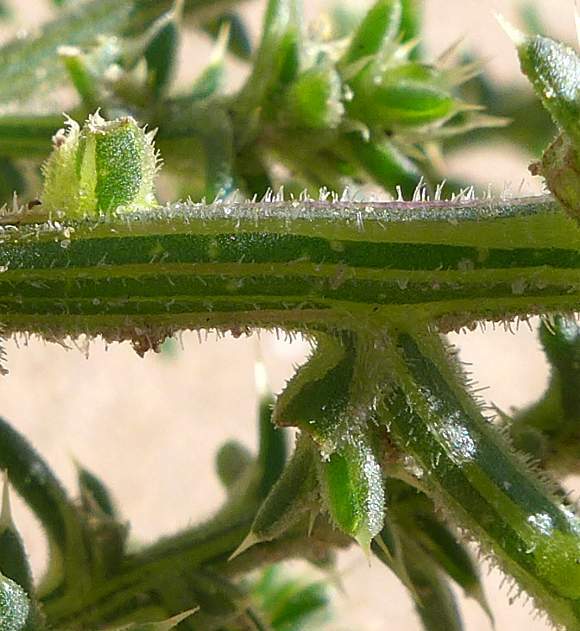 The leaves are fleshy, short, linear and succulent with an oval cross-section and tipped by a sharp spine. The leaf-like bracts are arranged in threes at the centre of which either a flower resides, or later the fruit. They are flat, triangular and they too are tipped by a sharp spine. 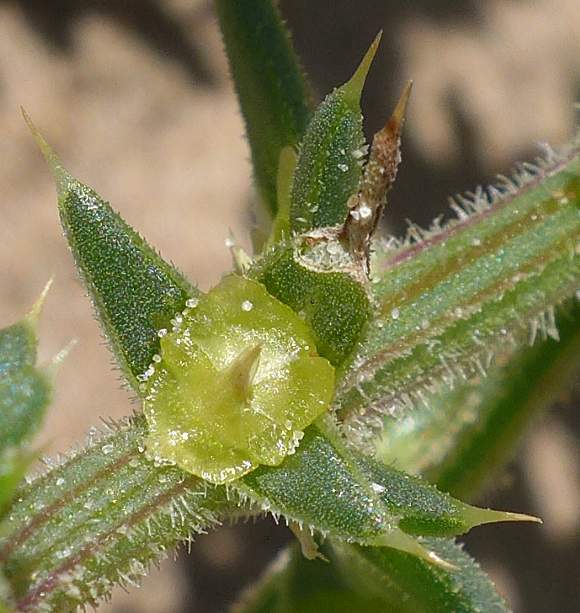 Bracts triangular, flattish, with paler lime-green margin and short bristly hairs. The surface is covered in white pimples. 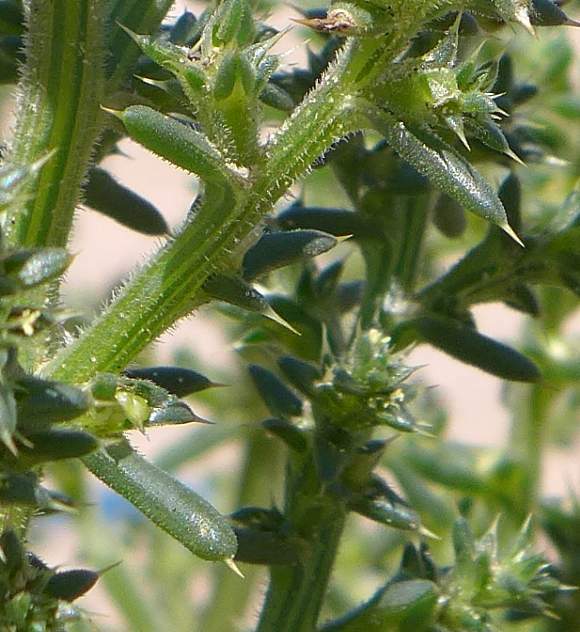 The spine-tipped bracts are arranged S E & W but no north. At the centre is either a flower, or later, as here, a fruit. Another fruit. 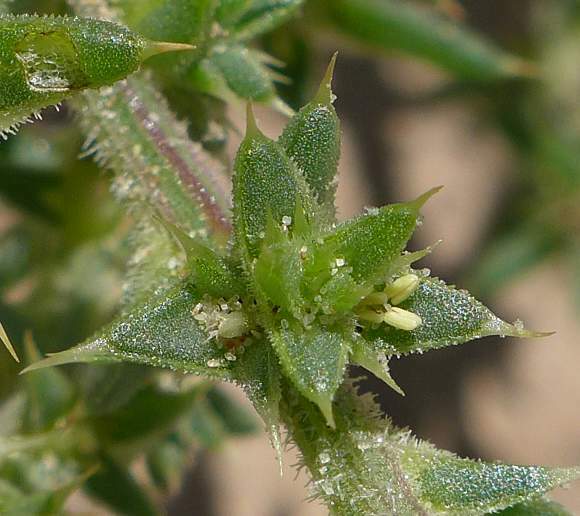 The stems have short white bristly hairs along the numerous pale-green or reddish ribs. Some stems are striped pale and dark-green. 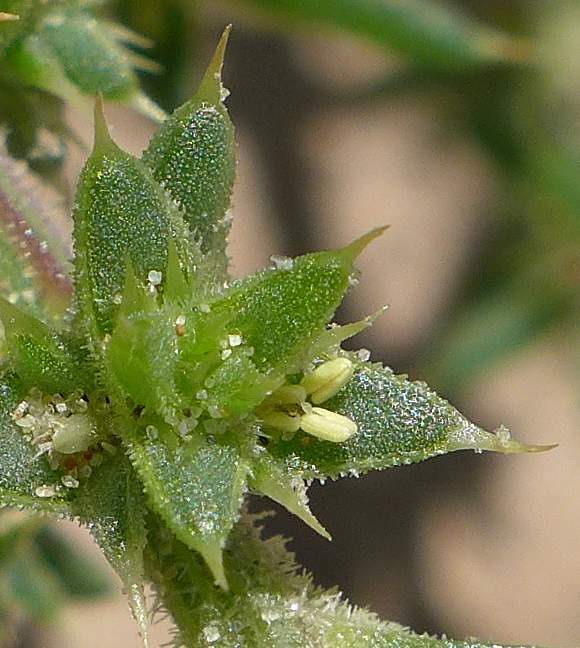 The flowers occur in the centre of three bracts. 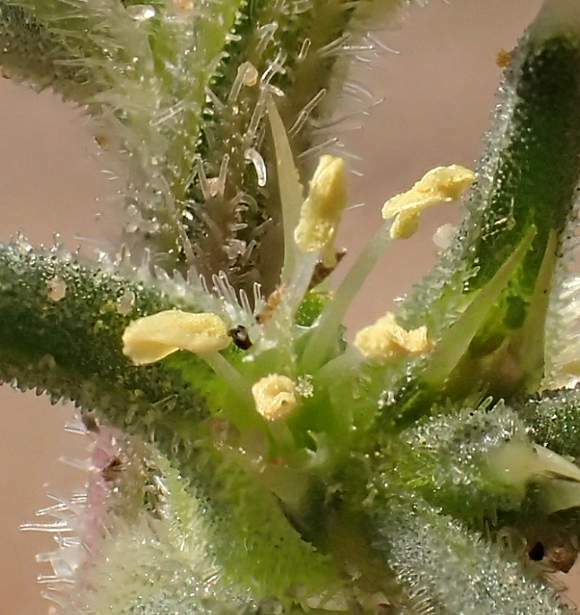 The flowers have five pale petals and five stamens with creamy anthers. Grains of sand for scale. Your Author has yet to find a plant with the petals visible. A flower with bracts and some fleshy spined leaves thrown in together just to make the flower even more hazardous to access without punturing an artery or vein. 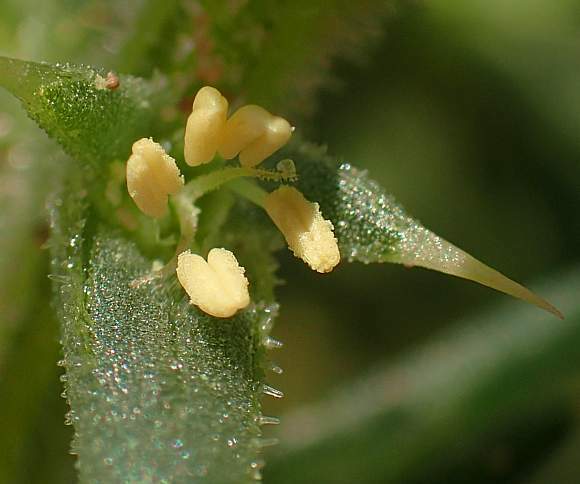 A flower with 5 stamens with cream-coloured anthers. 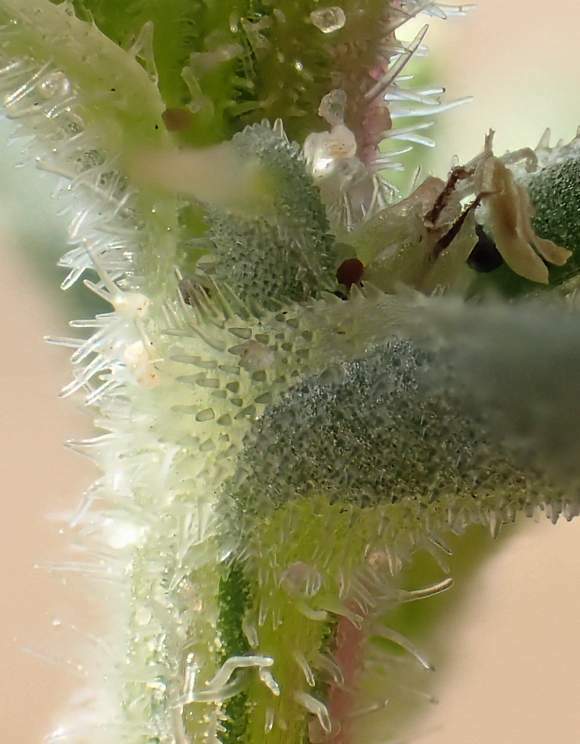 The fuzzy stigma is just visible in the centre of the stamens. 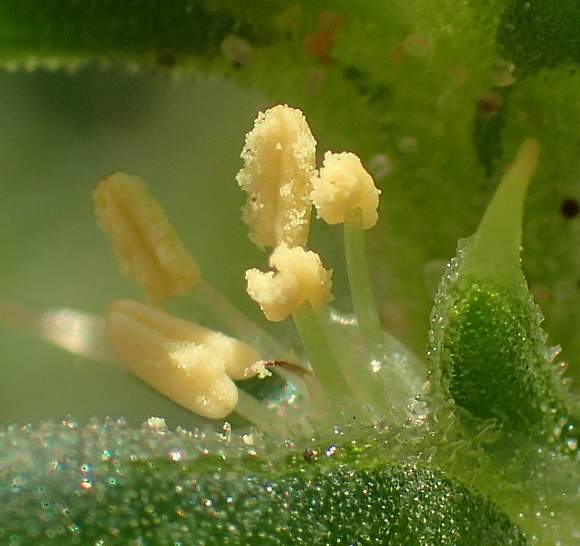 At great risk of injury to himself your Author has caught this close-up of the 5 stamens with cream-coloured anthers. Clear-coloured stubby projections on the edge of the bracts/leaves. The pollen appears somewhat fibrous. In the middle of the anthers two curved styles emerge in opposite directions, which also have tiny projections. Like Sea Sandwort there are translucent polyps around the leaf-edges, perhaps an adaptation to highly saline conditions. There is also a film-like wavy circle around the lot, could these be the illusive petals? The single fruit nestling at the summit of a whorl of spine-tipped triangular bracts. 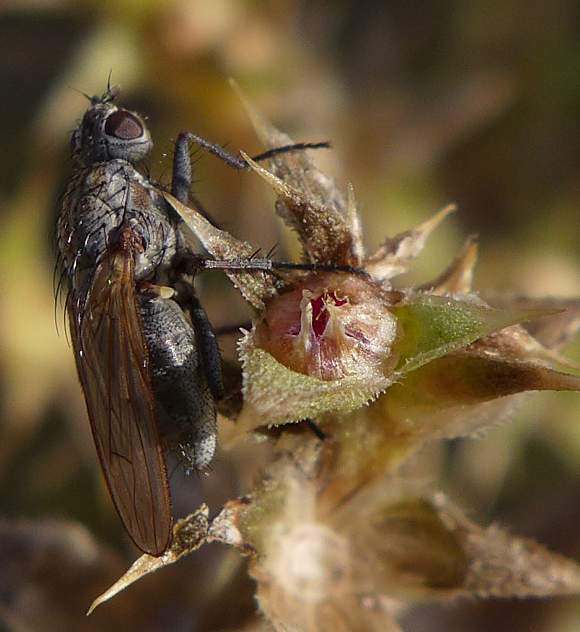 The fruits are usually winged. It is possible that the pink remains are those of the five white/pink petals. 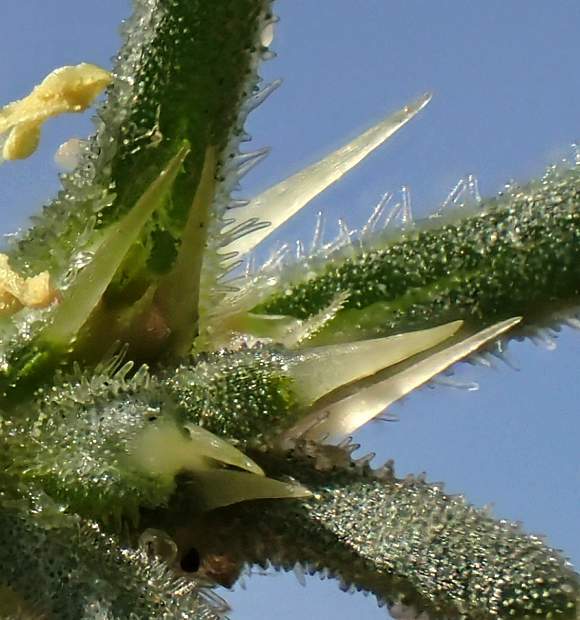 Fruit becoming more mature but is still wrapped in paperish bracts. 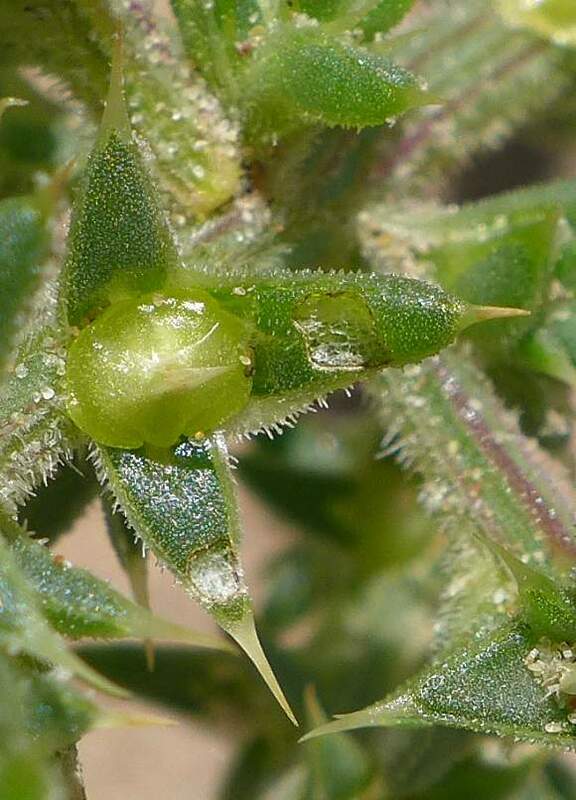 Short stubby conical hairs (centre) contribute to the overall whiteish granular texture of the green parts, whilst longer ones are more like hairs. 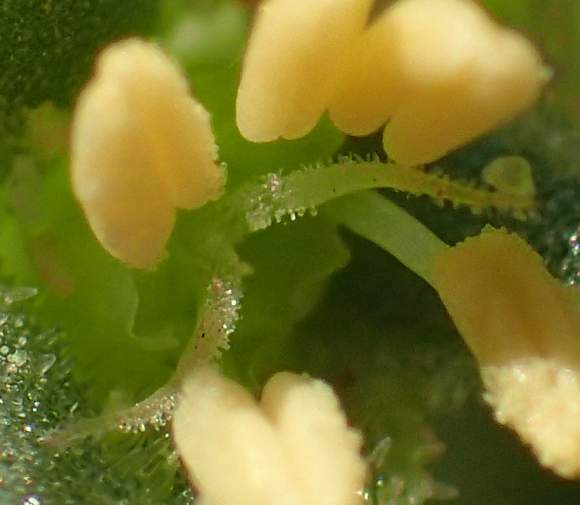 The frosted nature of the plant is generated by the far tinier transparent polyps. The irregular pinkish lumps are sand grains. 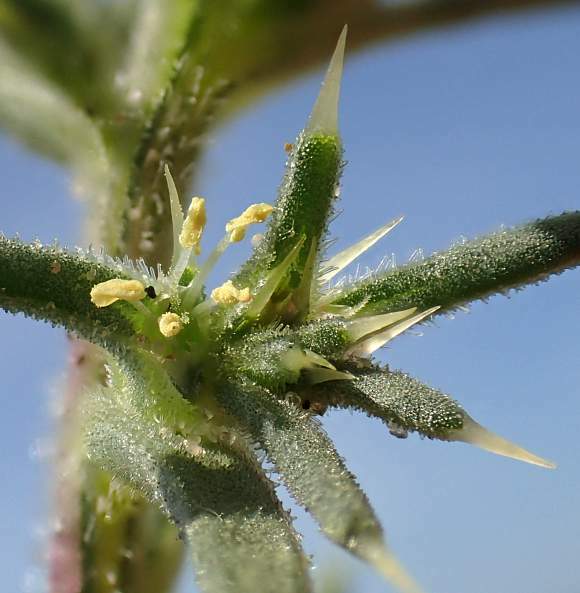 The elongated spear-shaped protrusions are the sharp spines at the ends of the fleshy leaves, the central hairy one being the stigma of one of the flowers. Shorter, thinner non-tapering transparent projections are the hairs whilst the hoar-frosted look is accomplished by the much tinier transparent pimples. They may all be made out of silica, just like the faintly pink sand grains. No wonder those long spines are sharp! [Far left are a couple of pale-yellow anthers]. 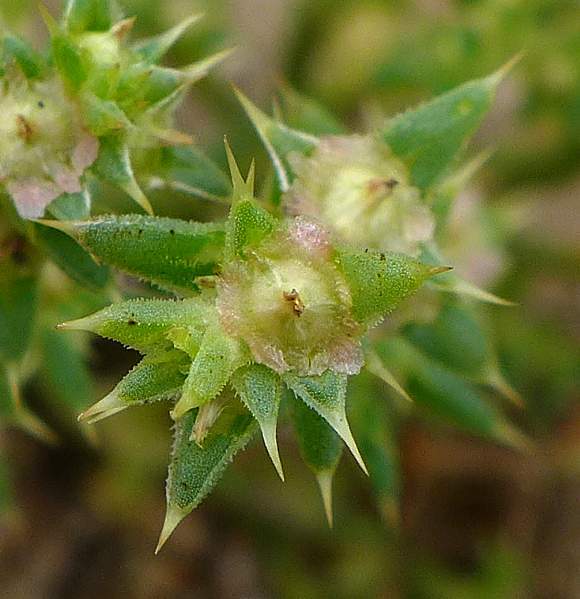 Many similarities to : Spineless Saltwort (Salsola kali ssp. tragus) but that mostly lacks the sharp spines at the tips of bracts and leaves and is erect and twice as tall at 1m. 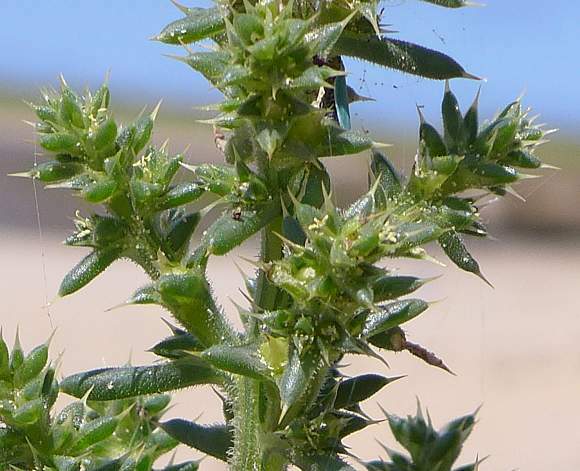 According to Wikipedia, Salsola kali has been moved to a differing genus, that of a new Kali genera, naming it Kali turgida (and the sub-species tragus is now called Kali tragus). 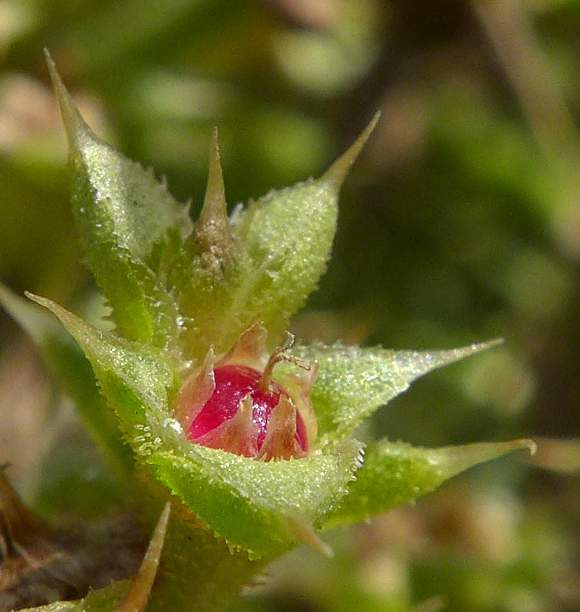 However, Clive Stace retains the Salsola genus name for the Saltworts and your Author follows suit. The 'kali' does not relate to the kali confectionery your Author bought as a child in the 50's: coloured and flavoured small crystals of sugar into which you dipped a wet finger and licked them off in your mouth, but is Arabic as is the word 'alkali'. The ashes from burnt Prickly Saltwort contains as much as 30% of Sodium Carbonate Na and a smaller proportion of Potassium Carbonate KCO3. The ash was commonly called 'soda ash' and is alkaline. The soda ash from Prickly Saltwort was mainly used to make glass but also has uses as a cleaning agent. 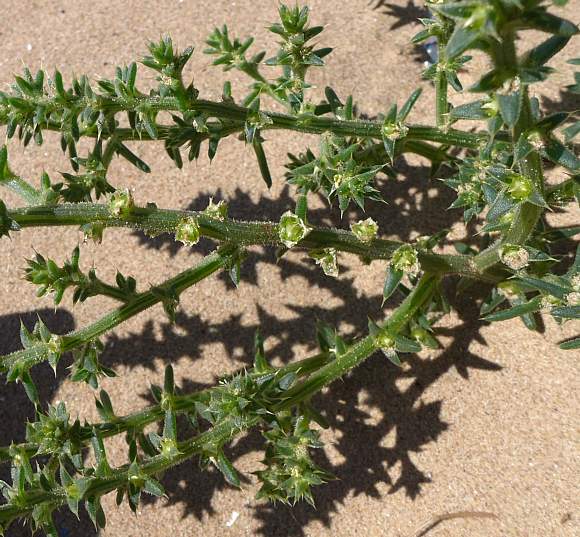 The name 'Saltwort' refers to this high alkaline salt content, rather than to common salt, NaCl, but growing by the sea it must also contain quite a high proportion of salt. It is a 'succulent' containing a high proportion of (salty) water. 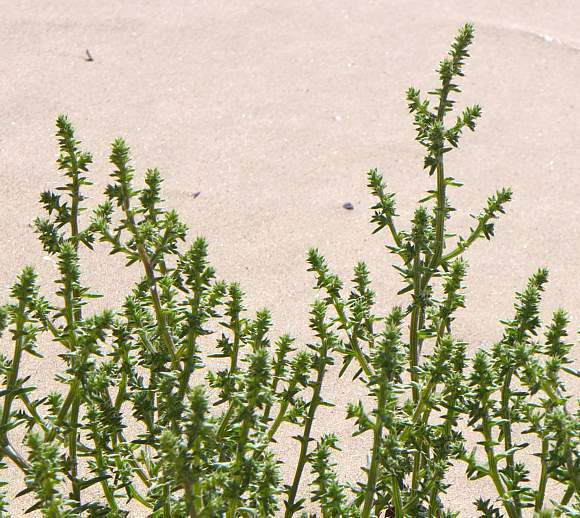 It is also classed as a Halophyte, a plant tolerant of (common or sea) salt. 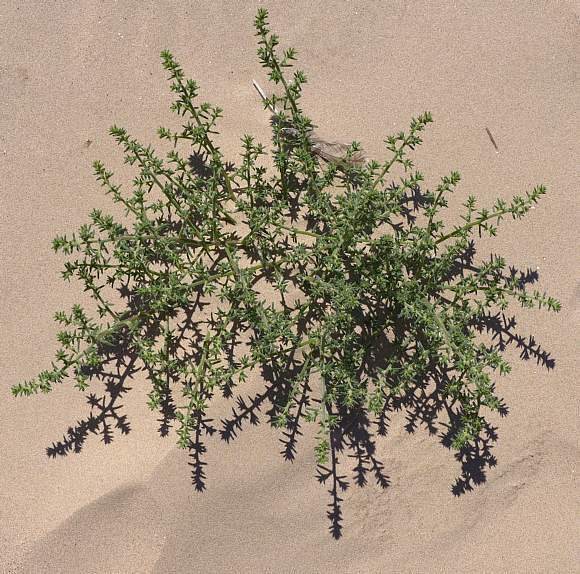 In the United States this plant grows much taller than the 50cm observed in the UK and is also known as 'Tumbleweed' because when it is brown and in fruit, the wind catches it and blows it across America over considerable distances, scattering its seeds as it tumbles over the land. 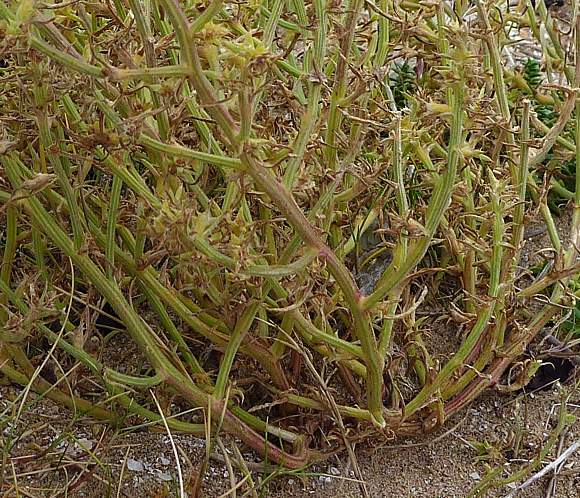 In reality, it is only one of several other different species of 'Tumbleweed' in America; so called because they too roll up into a ball as they are blown for hundreds of miles across the States. 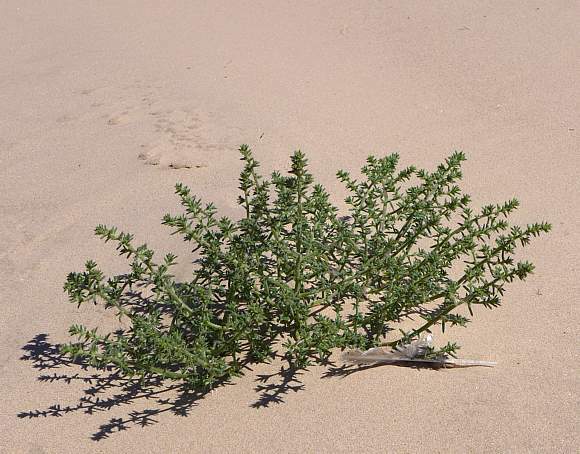 Like many coastal plants it is casual and opportunistic, sporadically appearing here and there when conditions allow - for, growing on the drift-line, it can easily get washed away by storms. 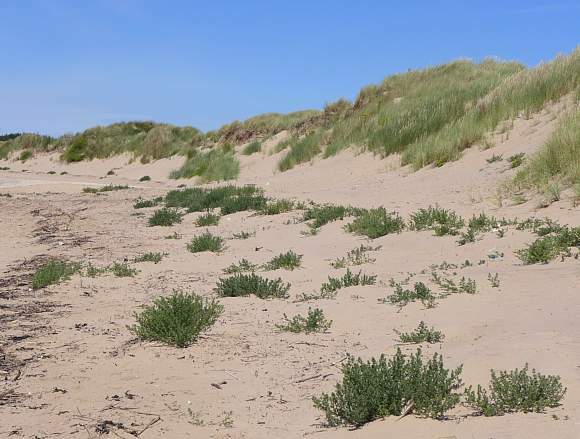 Such drift-line plants tend to have no special season, fresh ones can be found growing nearly all year round, those who live a dangerous life on sandy soil near the sea-shore cannot afford to be choosy about when they grow.